The CASITA project aimed at institutionalizing graduate and postgraduate courses on the application of modern IT&C tools in curricula at university level. The target group consisted of primarily of faculty members of the respective universities but eventually will consist of urban planners, geographers and other professionals knowledgeable of modern disaster mitigation tools. 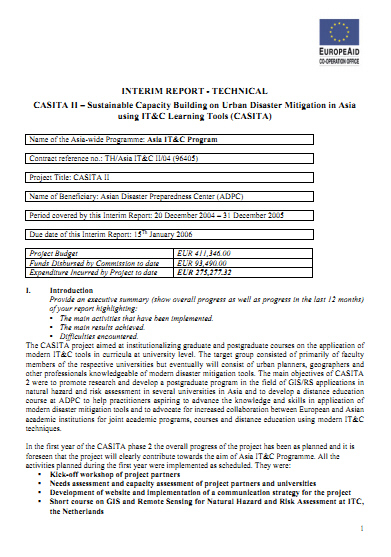 The main objectives of CASITA 2 were to promote research and develop a postgraduate program in the field of GIS/RS applications in natural hazard and risk assessment in several universities in Asia and to develop a distance education course at ADPC to help practitioners aspiring to advance the knowledge and skills in application of modern disaster mitigation tools and to advocate for increased collaboration between European and Asian academic institutions for joint academic programs, courses and distance education using modern IT&C techniques.